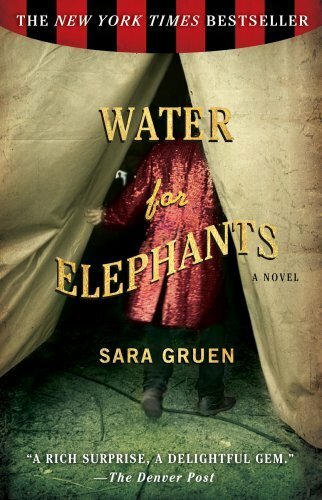 I've read Water for Elephants by Sara Gruen. 90 (or 93)-year-old Jacob Jankowski reflects on his time as veterinarian for the Benzini Brothers Most Spectacular Show on Earth, which he ran off to join after both his parents died suddenly and left him with nothing. Gruen culls many of the scenes that happen during these flashbacks from real live happenings. All in all, the circus is depicted as a dirty environment where performers and workers are segregated, and one needs to take on a survivalist mindset. The story provides a fun, eye-opening look behind the scenes of circus life during the Great Depression, but is also about the romance that Jacob discovers during his time with Benzini Brothers. I've been reading Pure Scum by Michael Sares, who is pastor of Scum of the Earth Church in Denver. This is in part his story of how that church got started, but also his reflections on what he's experienced. I first heard about Scum of the Earth (a reference to 1 Corinthians 4:13) because members of the defunct Christian ska band Five Iron Frenzy were instrumental in starting it, or have since been in positions of ministry with it. This is a church that truly strives to reach out to the outcasts, the left behind, the people who'd stick out like sore thumbs in conventional, "pretty" churches. As a result, Sares finds himself ministering to punks, Goths, slam poets, hipster artists, and a host of others who have been able to find a spiritual home in this setting. This book has provided yet another reminder to me of the church's constant need to reach out beyond its comfort zones. We watched The Invention of Lying this week, starring Ricky Gervais as a guy who lives in a world of complete brutal honesty; nobody is capable of lying. In effect, we're treated to exactly what every character is thinking, basically as if people have no inner monologue. Gervais' secretary tells him things like, "I've always hated working for you." A nursing home is called "A Sad Place for Hopeless Old People," and when he walks in an employee asks, "Are you here to abandon a loved one?" The absence of lying naturally means the absence of creating fiction: Gervais' character is a screenwriter for Lecture Films, which creates movies that are nothing more than a guy sitting in a chair talking about a historical period. Eventually, Gervais' character figures out that he can lie, which he uses for the usual sort of gain until he realizes that he wants his relationship with his love interest (Jennifer Garner) to be based on truth. This movie also has the most random bunch of cameos I've ever seen: Edward Norton, Philip Seymour Hoffman, Jason Bateman, Tina Fey, Jeffrey Tambor, Jonah Hill, and Stephanie March, among others. I've been listening to Widespread Panic's Til the Medicine Takes as I slowly accumulate their entire catalogue of studio albums. The drums seem more prominent on this one; it makes me happy.